In March of 2012, Ronda Rousey defeated Miesha Tate with a first-round arm-bar, stealing the Strikeforce women’s bantamweight title in the process. A little less than two years later, the pair met once again, this time as members of the UFC roster. In that second encounter, Tate managed to give Rousey a somewhat competitive fight, but was eventually arm-barred again, falling to a decisive 0-2 in this high-profile rivalry in the process. Indeed, for all her skill, it became fairly evident that Tate didn’t have much to offer Rousey, and as such, had little chance of wearing bantamweight gold so long as Rousey sat atop the division. Luckily for Tate, a game-changing Holly Holm head-kick forced the Rousey dynasty to a skittering stop in late 2015. And while this shocking upset did little to change Tate’s perceived chances against Rousey, her hopes of holding a title in the UFC suddenly looked much brighter, as it was widely speculated she might be able to unseat Holm where she failed to unseat Rousey. In the co-main event of last Saturday’s UFC 196, Tate did just that, pulling off a minor upset by defeating Holm with a fifth-round rear-naked choke. In a twist that seemed nearly impossible during Rousey’s ironclad reign, she is now the UFC women’s bantamweight champion. Unfortunately for Tate, however, there was little time for celebration, as she was almost immediately forced to turn her attention to her first defense. And while there was initially some speculation that her first defense might be a rematch with Holm, or even a scrap with former opponent Cat Zingano, it appears that neither will be the case. Instead, Tate’s first defense is expected to be against her two-time foil, Ronda Rousey. UFC President Dana White, who appeared on ESPN in the wake of UFC 196, broke the news. “I think that Ronda will now fight Miesha Tate for the title—that's what's going to happen,” White told the show’s hosts. Just like that, a massive shadow was cast over Tate’s title winning performance. While she’ll surely have some time to bask in her triumph, it will soon come time to start preparing for a third battle with a woman who appears to be her kryptonite. That said, Tate seems to be brimming with confidence. In fact, the typically classy bantamweight has already spewed some venom in Rousey’s direction, telling TMZ that she has doubts about her rival’s motivation. These comments, of course, are in reference to Rousey’s recent appearance on The Ellen DeGeneres Show. During the appearance, Rousey touched on the dark stretches that followed her loss to Holm and suggested that the prospect of starting a family with her current boyfriend, UFC heavyweight Travis Browne, helped her bounce back. “To be honest I looked up and I saw my man Travis was standing up there and I looked up at him and I was like, I need to have his babies. I need to stay alive,” Rousey told DeGeneres. Then again, while Tate’s comments are based on actual statements from Rousey, it’s unlikely that Rousey will lack any motivation for this comeback fight. While it has been many months since we’ve seen the former champion in action, she’s made it clear that, despite her busy schedule of acting gigs and magazine shoots, a return to fighting is atop her list of goals. And really, whether Rousey’s motivation is on point or not, her two previous defeats of Tate mean that pretty much everyone will pick her to win this third encounter. The fight’s early betting odds, which were just recently released, reflect this fact. Despite Tate’s looking better than ever, most sports books have her pegged in the area of +350, meaning that winning a $100 bet on her would earn you $350. Rousey, meanwhile, has been painted as a major favorite, floating at about -450. This means that a successful $100 bet on the former champ would net just over $20. Yes, though Tate’s title reign may only be a few days old, the details surrounding her first defense are already taking shape. Her opponent has been announced. That opponent, who is one of MMA’s biggest stars, and Tate’s truest rival, has acknowledged that it’s time to get back to the gym and start preparing. Tate, in turn, has landed the first blow in what’s sure to be a highly-publicized war of words. And finally, despite Tate’s recently realizing a career high, and Rousey’s sitting at a career low, the early odds for this bout have been released, and identify the new champ as a sizable underdog. So, while Rousey’s comeback fight with Tate is not expected to occur for many months—perhaps even as far off as November—it is already generating headlines. 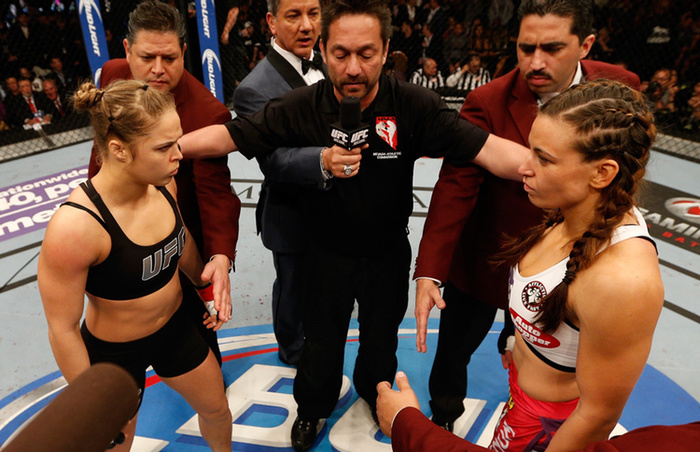 That’s sure to continue as the latest development in Tate and Rousey’s infamous rivalry draws ever closer.